The Academy of Digital Media provides a wide range of available Training programs. They can be customized for your company, people, markets, region(s), products and more…in-house at your offices or at any location of your choosing…nationwide or worldwide! We can also build new courses on virtually any subject for your company needs through our Laredo Group Instructional Design division. Academy of Digital Media will customize a course curriculum based on the foundations of our almost 2 decades of industry knowledge and training experience. In addition, we can create completely new course content to address the specific needs of an organization. The training can be delivered through in-person live sessions and/or on-demand or live webinars. The Academy of Digital Media curriculum development process utilizes the most effective teaching and adult learning models so that students will learn and retain more, faster … and be able to quickly translate their learnings into improved skills and apply new knowledge to be more productive and effective. The adtech and martech ecosystems are very complex and rapidly evolving, and there is a lot to learn, especially if that learning is expected to result in immediate job performance improvement. The most effective programs require time to learn, apply, practice and reinforce the new skills and knowledge. Academy of Digital Media private training sessions are designed to accommodate any amount of available time and budget. We’ll work with you to make sure that your training goals and outcomes can be achieved given the program length chosen, and include options for ongoing reinforcement and coaching programs. Every Academy of Digital Media instructor has many years, often decades, of actual real-world digital advertising experience. But perhaps just as importantly, they are also skilled and experienced teachers, coaches and consultants … able to interpret the many complex principles and topics of digital and integrated advertising in ways that students can truly and easily understand … and relate to for instant application in their world. Presented at your offices or at any location(s) of your choosing … worldwide. Academy of Digital Media instructors can present the program at an adequately size facility in your offices, or at a local or other hotel, conference center or other appropriate venue of your choosing. For companies with multiple locations, a multi-city presentation of the same or localized program can also be scheduled. 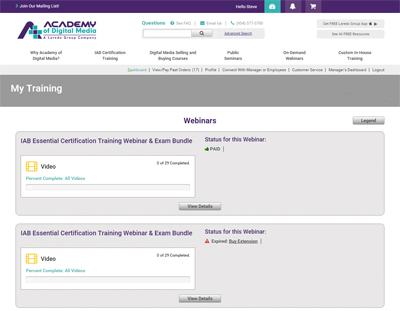 For Private Training clients using our online webinars or testing, a Learning Management System and fun Dashboard functionality is provided. Users can access and track their exams, webinars and progress, and managers at various levels can monitor the activities and progress of all subordinates enrolled in the program. Leverage the fact that all of your people are together already by having the Academy of Digital Media present a program before, during or after your already scheduled meeting(s). One of the main advantages of in-person training is that the students can interact with and ask questions of, the instructor. A program allowing the required amount of time can also include role-play and/or many other types of exercises and activities designed to further improve learning and retention. Some examples of the hundreds of previous Academy of Digital Media Private Training programs we’ve done since 1996. For a local media company, with over 1100 reps across newspaper, TV and radio, we created and taught a customized three-day program in 10 different markets, and attended by senior sales executives, marketing, ad and revenue operations and management staff. This comprehensive training was augmented by a 2-step testing and certification program (pre- and post-training assessment) as well as a corporate license for our standard webinar. Client reported a 10X return on their training investment. For a national cable operator, we taught a customized two-day media training for 400 local media reps and corporate management staff across 10 markets. This was augmented by a 2-step testing and certification (pre- and post-training assessments) and intensive role-playing and group activities to improve the adaptation of new skills. Client reported a significant change is digital sales practices and return on their training investment. For national consumer magazines, we delivered two day digital and integrated media sales training with follow up sales skills training for individual magazine brands. These training sessions occurred over about two months, in different locations, including entire management teams, sales and support staff. The initial training was followed up by advanced training several weeks later, and then by review and learning application and reinforcement programs through the end of the year. Client reported their print sellers incorporate digital on every proposal and close 50% of the deals. For a regional/national newspaper, we provide 2-4 program per year covering the digital media basics, programmatic, search, native advertising and other topics essential to local selling. Client is committed to ongoing training based on the increased confidence levels and the fact the team keeps exceeding their digital sales budgets. For a B2B media company, we have provided several programs including hosting and emceeing a 2.5 day sales meeting to develop customized sales presentations, including pre-training homework assignments to workshops at the annual sales meeting, presentation evaluations and follow up sessions to hone specific sales skills. For a major regional newspaper, the goal was to reinforce industry knowledge to pass the IAB Digital Sales Certification. Result, 100% of the 50 training attendees passed the certification exam. For a shopping portal, the training goal was to raise the digital IQ of the 125 person sales team, and after two days of training, the average score increase was 33% and 100% of their team achieved the passing score and the sales team exceeded their digital goals. The webinars are now used for onboarding all new hires. These course outlines are modified and the curriculum customized for each client based on specific training goals and learning outcomes. Please enter your first name and email and the information is one click away.